Ecuador’s coast is known for its beautiful beaches, warm waters, and relaxed style of life. But what is also exceptional about this area is the savory foods that make up the typical cuisine. Differing greatly from the chicken and potato gastronomy of the sierra, the decadent seafood and fresh fruits and vegetables thatcan be found all over the region leave no question as to why so many people have fallen in love with the coast’s local flavors. Sitting directly on the Pacific Ocean, mariscos (a general term for seafood) are veryeasy to come by and very popular. Pescado (fish), camarones (shrimp), calamar (squid), concha (black shell), langosta (lobster), and cangrejo (crab) are offered on almost every menu and the price is typically asdelightful as the food is. Freshness is practically guaranteed withmany of the restaurants purchasing their ingredients directly from the daily seafood market in town; and no seafood plate is complete without some patacones (fried plantains) and a healthy serving of arroz (rice.) At the end of every meal you are sure to feel satisfied. 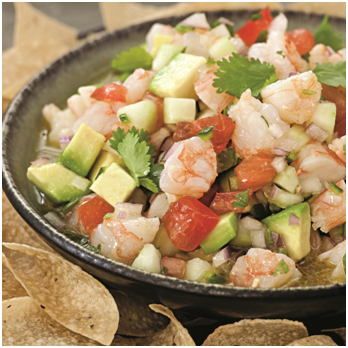 Ceviche is pieces of raw fish (or shrimp, clams, crab or other seafood) marinated and cured bylime juice and salt with onions, tomato, cucumber, avocado, and cilantro. It is often eaten for breakfast, and served with patacones of chifles (plantain chips) in order to soak up the marinade. The citrusy freshness of this dish makes it unlike any other dish we have tried and that is why ceviche makes it at number 1 on our list of favorite foods in Ecuador. 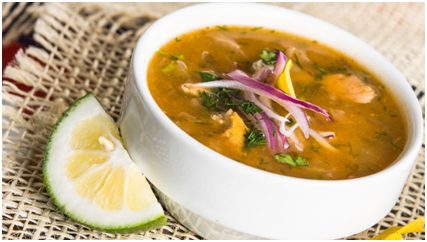 Encebollado is a fish soup made with onions and yucca. It is usually served for breakfast and diners can spice it up as they like by adding lime, oil, pepper, or the local aji (hot sauce). It is highly filling and fully energizing. It is also known as the ultimate hangover cure with its high Iron content and many Ecuadorians enjoy a morning bowl of it after a night out on the town. Tigrillo is a tasty breakfast dish made up of mashed plantains, cheese and a fried egg on top. 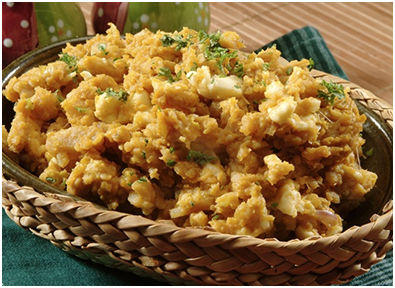 Simple yet fulfilling, this dish is sure to leave you with a happy belly. We love our tigrillo with loads of Aji (in house hot sauce). 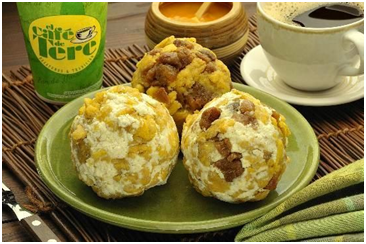 Bolón de verde is tigrillo in ball form. The only difference is it is fried instead of boiled. Most come with cheese however you can also enjoy them with chorizo or chicharrones. Sometimes served with an egg and a cup of coffee, a bolón is a great way to start off the day. 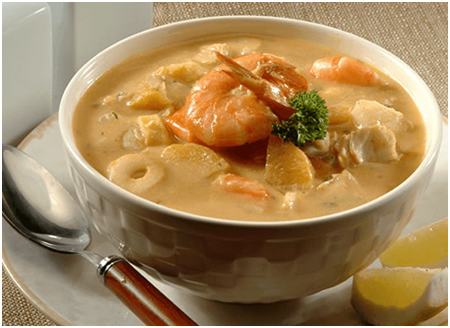 Viche de Camaron is a peanut-based fish stew with plantain, shrimp, and yucca. Many times it is one of the soup options offered during lunch. People find it especially delicious when squeezed with a generous helping of lime and it will leave you wanting more. 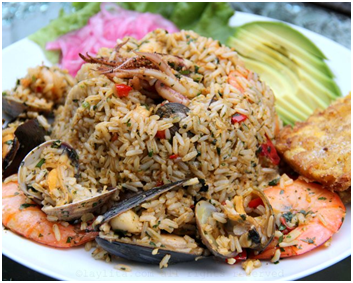 Arroz Marinero is a grand mix of brown rice, a variety of seafood including shrimp, squid, and black shell, onion, garlic, pepper, cilantro, and various spices. It combines all of the mouth-watering flavors of each ingredient together so that every bite is just as delightful as the last. There are many other flavorful foods that come from the coast of Ecuador but these are just a few of our favorites. Whatever your preference is, there is sure to be something that satisfies your taste buds. See Live the Life’s recommended restaurants of Puerto Lopez and find out where the best restaurants in town are to enjoy these appetizing meals.